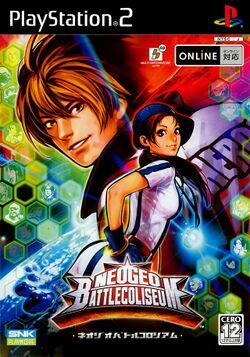 NeoGeo Battle Coliseum (hereafter referred to as NGBC) is a fighting game that was developed by SNK Playmore and released in 2005. It features characters from several franchises that graced the Neo Geo arcade and home console systems, like The King of Fighters, World Heroes, and Metal Slug for example. Determined not to be outdone by Capcom, NGBC plays very similarly to Capcom Fighting Evolution, but with more fighters and a tag team element. NGBC was initially developed for the Atomiswave arcade hardware developed by Sammy Corporation (which itself is based upon Sega's NAOMI system which is similar to the Dreamcast hardware). It was later converted for play on the PlayStation 2 and Xbox 360. The game system of NGBC is a 2 vs 2 tag battle, regardless to how many players are playing. While the 2-player game system is similar to most tag-team systems of other games, the single player system is unusual. Single play is more like a survival battle, where the player must beat team after team for as long as possible. The player is given 300 seconds, and when time runs out, instead of win or lose, the player will face the boss (depending on how well they perform). During the boss fight, a time-out will determine the victor. Gain more time. Extra time helps the player to beat more teams; the game records the number of teams defeated in the hi-score table. Gain full power gauge. This is to defeat the opponents as quickly as possible when the next battle starts. Add more life. This is to survive longer against high-damage opponents. Although we tried to develop the illustrious NeoGeo World for many years, one man was putting his dangerous plan into effect. "I will topple NeoGeo's most powerful warriors and put myself on the throne!" As NeoGeo World drew closer to the verge of disaster, a WAREZ sponsored fighting competition was announced. This event is called "Battle Coliseum". The Federal Government, worried about the situation, secretly dispatched two agents; Yuki and Ai. A world on the verge of eternal darkness. And NeoGeo World's fate was in the hands of the combatants gathering at the site of the tournament. * The name WAREZ is a not-so-subtle jab at the "warez" community of software pirates which SNK Playmore blames for much of the financial difficulties that they experienced, which caused them to close down for a period of time. This page was last edited on 25 June 2012, at 10:40. This page has been accessed 26,933 times.